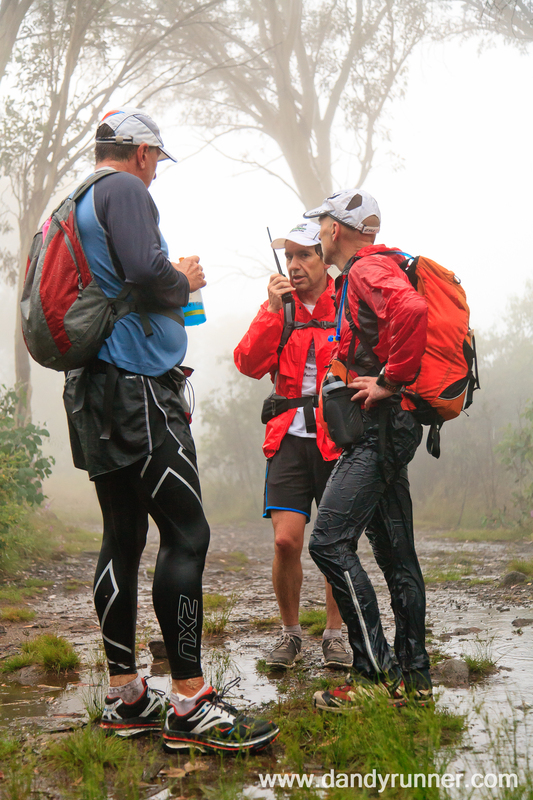 Bogong to Hotham Race Report – When the Racing Stops and the Rescue Starts! As that statement echoed around the Mt Beauty Country Club on Sunday night, I doubt there was anyone who would want to trade places with him at that moment. What started out as a race with one of the best assembled fields in its history ended with cancellation, disappointment and genuine concern for individuals still stuck on the mountain. To me there was a critical moment over the weekend, that made the final outcome such a success with all runners returned without serious injury or loss of life. 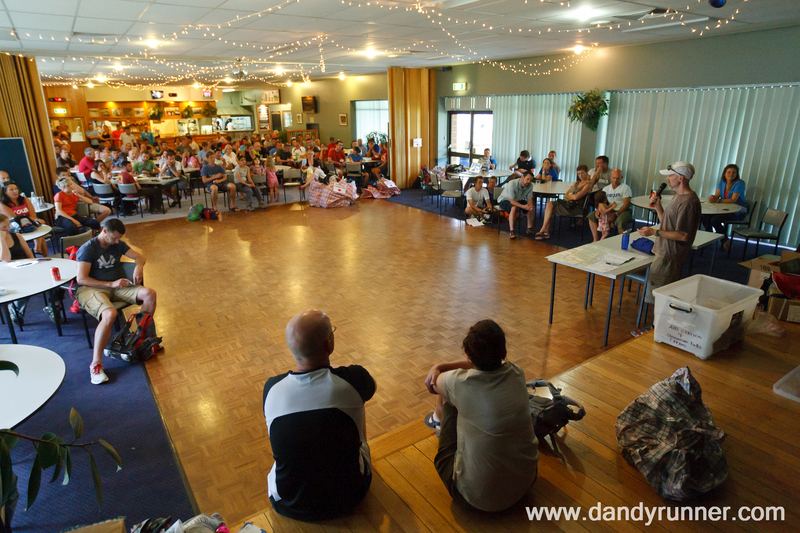 Let us go back to a gloriously sunny and warm Saturday afternoon and we find the runners filing in to the ballroom of the Mt Beauty Country Club. The usual acknowledgement of other runners, new friendships made and old acquaintances reaffirmed all added to the excitement of the race to come. The usual suspects were milling around sizing each other up, doing the usual thing all us runners tend to do and that is to see how fit people look, what sort of splits they are aiming for, what shoes and backpacks are people sporting, weather forecasts (more on that later) and who is hiding injuries. It very quickly became evident that there was a lot of interstate runners in town and most of them were here to race at the pointy end of the field. Talent such as the No Roads racing team from the Blue Mountains of NSW brought their A-Team, Donges, Davies, Cardelli, Lee and McClymont were all finalising their gear before lining up to get it checked. Last years podium getter Damon Goerke and GNW100 miler runner up Matt Cooper were doing last minute tweaks to their drop bags. As the runners came and went a common theme was emerging when it came to gear and that was because Andy and his deputy RD Brett Saxon were being pretty tough at the mandatory gear checks. A few runners were sent away to get a wider compression bandage (for snake bites) and few didn’t have the right type of thermals. It was at this stage that training buddy Clarke McClymont came up to me and asked me for my opinion. What could someone with a racing pedigree of Clarke want from me ? Well he showed me what can only be described as a bin liner masquerading as a waterproof jacket. It was the new North Face Verto jacket which claims to weigh less than 90 grams. He was a little disappointed that Brett had asked him to provide evidence that this new type of technology was compliant with the race requirements of 100% waterproof with hood. This is where I came in. Traveling with laptop, iPhone and iPad I quickly set to work tracking down the tech sheets of this jacket only to reinforce Clarke’s disappointment that whilst being incredibly light and windproof, it wasn’t going to get across the line as a waterproof jacket. As I was pulling out of the race as a precaution due to some minor achilles tendinopathy it appears every cloud has a silver lining, as I had all my race gear with me and so I quickly summoned the services of Passpartout to go get my jacket from the hotel. Clarke returned from check in with a clean bill of health. Now he could focus on race day. 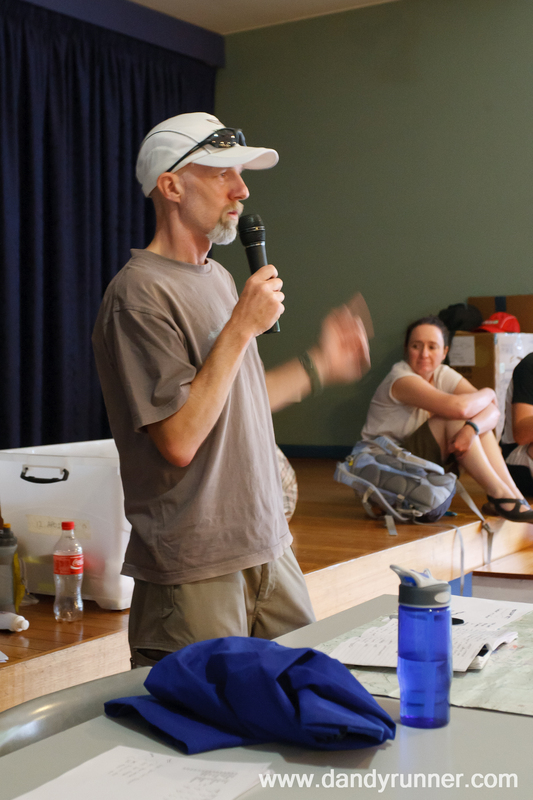 Once all runners were registered, gear checked, Andy then conducted the pre-race briefing which included course conditions, navigationally challenging sections of the course, and the usual runner protocols to assist others in strife should you come across them. There was a brief chat about the weather but with the likelihood of some early rain showers and mild temperatures forecast the decision was to go with the “light weather pack” option. This still meant enough gear to remain safe on the mountain, but not the full on blizzard/monsoon conditions the Victorian Alps can throw at you anytime of the year. As the evening wound down and the runners enjoyed their last meals most of departed for bed with a final glance skyward remaking at how beautiful and ominous Mt Bogong looked in the moonlight. Little did we know what she would throw at us come race day. I was sharing a room with regular training mates of Ultra168, Gareth Parker and Mick Miles from the Terrigal Trotters running club. Now Mick is not known for his fashion sense but he lets his running do the talking. As we woke on Sunday morning Mick was first to enquire as to the weather conditions as the night had been somewhat humid. I popped outside to report that the drizzle from the night before had now turned into a more persistent and steady downpour, but it still felt warm. He chose to stick with his plan of shorts and a T-shirt to start. 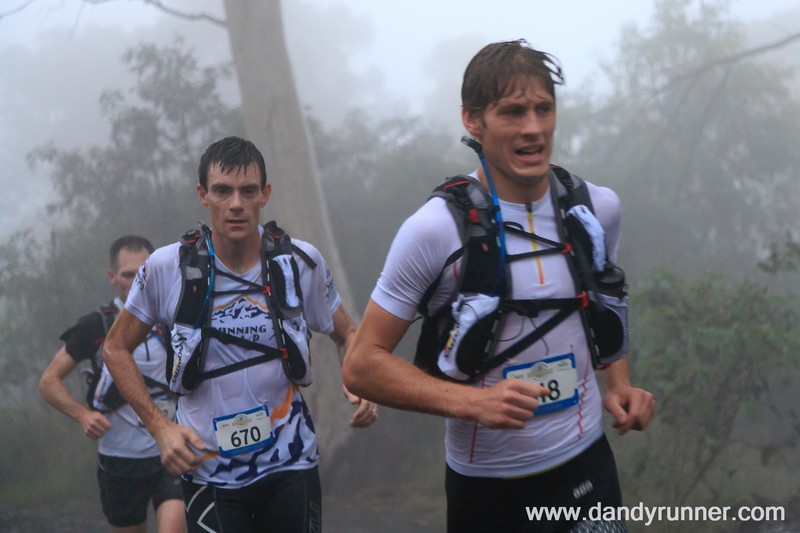 As we made our way to the start, I planned on running out to the start of the famous staircase climb up Mt Bogong. This is approximately 2.5kms from the start and would give me a great opportunity to see who had their game face on and who was playing the waiting game to make their move later. As I left the runners in the dark at the start, it was clear most were dressed for the humid conditions, singlets, shorts and t-shirts were evident everywhere. It took me about 20 minutes to find a suitable spot in which to film and shoot some pics where the runners would hoof it up the 1300 + mtrs to the summit of Mt Bogong. As the first light of dawn started to allow me to see my surrounds and the stunning beauty of the rainforest, the first sounds of a runner approaching broke the silence. 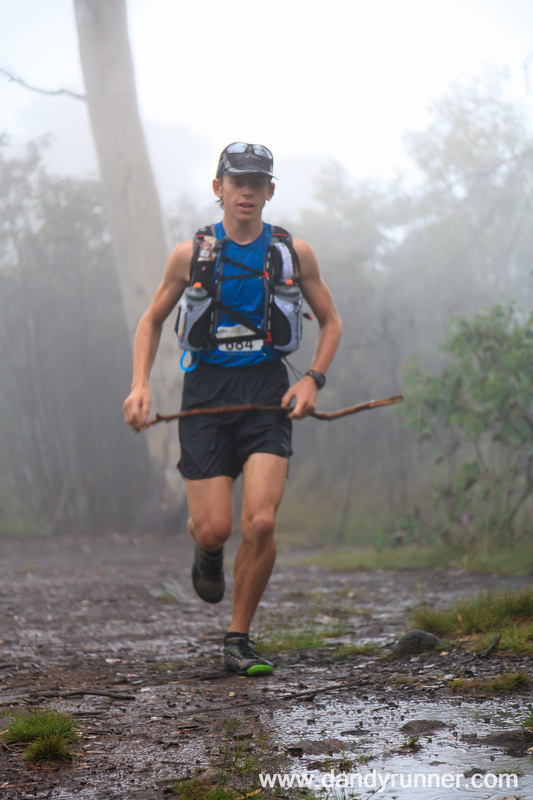 It was Andy Lee, TNF100 race winner and New South Welshman. And boy was he on a mission. As my video on the day showed, he was powering his way up the stairs and in direct conflict with his pre-race mantra of not taking it out too hard. He made the irregular stairs on the mountainside look like mere trip hazards. He was followed approximately 30 seconds later by fellow Blue Mountains runner Mick Donges. Mick has the ability to make even the gnarliest trail look easy as he has one of those nice springy running styles. A few seconds later the rest of the field started to flow through, some running the stairs, others like Damon Goerke power walking to great effect and others barely surviving the incline, cheeks and chest puffed out hoping the climbing would soon be over. Only another 4kms of this people and you will be rewarded with views of the high plains just shy of 2,000 metres above sea level. I made a return back down the trail to the final distant echoes of the runners climbing high above me resonating through the tree canopy. Next stop the 35km mark and scene of the first cut-off which this race is famous for. A quick coffee stop and some refreshments at our favourite new bakery in Mt Beauty and I started the twisty climb up to Falls Creek and around the reservoir to Langford Gap. About 20km into the 60km drive I noticed the rain didn’t get any harder but there was more and more debris on the road. Still further up the road, the trees started to sway more and the car started to be buffeted by the wind. I thought this didn’t look good and where the hell did this wind come from? A quick check of the in-car display indicated the outside temperature was still a balmy 17 degrees at around 1,500 mtrs. I cleared the treeline and was greeted with horizontal rain, very little visibility and a crazy noise not too dissimilar to a jumbo on take-off. Wow, the conditions have certainly taken a turn for the worse. I arrived at a near deserted Langford Gap car park to what can only be described as gale force winds, lashing rain that hurt and a wind chill now down into single figures. A quick chat with radio operators and it was quickly becoming evident that things were going to get a whole heap worse before they got better. I thought to myself the 1996 race record was safe for another year. Shortly after, Andy Hewat showed up and we barely able to have a muffled chat in his car. He was going to give Andy Kromar, who not only knows this race well as the current course record holder but more importantly a Parks Victoria ranger a call. It quickly became evident that the race was going to end short with it being abandoned due to the worsening conditions at Langford Gap. And so to the most impressive part of the weekend for me. Andy let me know immediately that the race was going to be called off due to reported gusts in excess of 120kph over at Mt Hotham and a huge rain mass that wasn’t going to clear anytime soon. Now it is one thing to make the call, it is another to actually execute it! Getting close to 100 runners and volunteers off the mountain safely was going to be interesting. I suddenly thought long and hard about how I would now use my Ultra168 Twitter and Facebook updates, which until now had been all about the athletes and the race up front, by putting it to a better use to inform those interested in what was about to go down. My first Tweet was to let everyone know that the race was being called off and the second message was to reassure people that Andy was the best person to execute the risk mitigation plan. What followed is what can only be described as something that is part of Australian’s DNA, and that is the ability to muck in and help out in times of need. The first job was to try and create something akin to a wind break to allow the RD and team to keep relatively dry and warm and to provide a safe refuse for the runners coming in. Now that was a little easier said than done as 6-7 grown men and women all clung on with dear life to Brett Saxon’s heavy duty gazebo’s as we tried to stake them in to the quickly sodden ground. Thank goodness he didn’t decide to go to Bunning’s the day he felt he needs to buy 4 Gazebo’s ! These things could withstand a hurricane and today they got their best work out possible. Next, it was to try and get as many vehicles including the coach destined for the finish to be at Langford’s to ensure the runners had an easy, warm and dry passage off the mountain. Finally, word had to pass back to the field of runners and volunteers that the race was cut short. And this is where the true spirit of the race came alive. Some athletes were so far up the field that they had already passed the final radio check to Langford, so they continued to run as if they had another 30km to go. Others took their foot off the gas to just try and keep warm and look out for others who were starting to feel the conditions bite and then there were others who emptied the gas tank knowing that their energy reserves were only ended for a few more km’s. Throughout the morning as runners appeared out of the clouds, the elation on their faces was pretty evident. That was a lot of fun whilst you were moving, being able to knock over sub 4 min km’s with a tail wind is not something you get in your average ultra. Also there were some stories emerging of runners assisting others who were struggling to stay upright in the conditions and whose core body temperatures were starting to drop. One such story came from Philip “Spud” Murphy and running mate Chris Yates. Now Spud had been entrusted with sweeping the back half of the course, so he decided to run the first half as a warm up! As he and Chris came across a runner who was clearly struggling with the conditions they quickly assessed the early signs of exposure and ensured he was able to make it to a hut for shelter. It later became clear that this runner was not only slurring their words but had lost about an hour of their memory during the height of the storm. When Andy Kromar arrived, he went onto the course with his 4wd to collect a couple of runners who had decided to take the sensible option of utilising one of the huts for refuge. One of these athletes was Samantha Gash better known for her desert racing experience, who found herself at Roper’s Hut in need of warm clothing and was lucky to be assessed by one of the medics as having early signs of exposure. She was able to rest, recover and made her way out safely in a vehicle a few hours later. So, whether or not we all agree that the race results for the 2012 running of the B2H mountain ultra are a true reflection of what the final finishing line would have been we will never know. But one thing is for sure, that when the racing stopped, the actions of Andy and his team ensured that everyone left the high country with a few new lessons learned. Firstly, we all know the weather can change on a dime up at these altitudes, but regardless of which weather forecast you read, be prepared for anything. Secondly, mandatory gear is there for a reason, often called out as a reason for a sponsoring clothing brand to sell more gear, but very rarely called upon to save lives. On this occasion, the RD was right in enforcing strict and consistent rules for all people toeing the start line. And finally, we race all year round and very rarely does anything like what unfolded this weekend happen to us, but when it does, it is great to see all that oft described as redundant planning finally comes alive to save lives ! So, from my perspective it was certainly an eventful year in which to get a minor injury to keep me from the start line, but thank heavens I did, as I wouldn’t want to have been out their in a compromised position and secondly, I would never have seen what goes on behind the scenes of a race as iconic as Bogong to Hotham. As Andy repeated to me the “Who wants to be a RD?” later that night, I was happy in knowing that the race is in good hands as no one took him up on the offer. A big thank you to Andy and his team and also to Erwin and team from Dandy Runner for the amazing images captured in incredible conditions! It was a shame that B2H 2012 didn’t produce a result, particularly with a field of that quality lining up at Mountain Creek. But the RD’s got to do what the RD’s got to do. With winds double what the Bureau were predicting, stopping people at Langford’s was the right option even if some of us thought we could still get to Hotham. Actually, precisely because a few of us pig-headed fools thought we could still get to Hotham! A quality course, a quality field and quality race direction. Had the weather come to the party we could have had a quality race, but there’s not a lot Andy and all the other volunteers can do about that. Bring on 2013 I say. Thanks for the perspective and kind words, Marcus. Although the organisation and prep had been pretty much a one man job the ultimate success (measured by runner and volunteer safety) was entirely due to a team effort. As I said at the presentation post race, it was fantastic the way everybody jumped in to help. I know another runner worthy of mention: Beardy. He nursed a very stressed/injured/hypothermic runner through from Ropers to the finish. Later he messaged an offer to drive back up from Mt Beauty to help ferry runners off the mountain if needed. One of the vols , Grace, rang her husband to bring their family van up from Falls (they were there on holidays) to drive runners down to safety. Brett worked tirelessly to manage runners coming in to free me up to co-ordinate with the radio operators and Parks. Incidentally, I never managed to get that call in to Andy Kromar before making the decision. I had seen enough and knew what had to be done. Calls through to Mt Hotham confirmed my fears. It was the worst the radio guys had ever seen. The gusts on Hotham were recorded at 140kph. When Brett and Darren retrieved the supplies from Pole 333 the next day it was all floating. The radio guy and vol heading in there when I called things off were struggling to actually get there and were fearful of hypothermia themselves. Thanks also for your help both physically and with communications on the day. I knew a lot of crew would be followng your feed so was relying on that to help spread the word. Good work. And they reckon summer is the best time for the AAWT! i think anybody saying that B2H 2012 failed to produce a result is disrespecting the work of Andy, Brett and every vollie and supporter who made the race what it was, and disrespecting the front runners who all battled the same conditions, some for less time than others. It was a great experience, the elements were more inspirational than overwhelming, and just as every course and every race have their own distinctive characters so too, certainly, did B2H 2012. Thanks Marcus for the blow by blow write-up. Didn’t know how things had developed until reading your report – nice one. 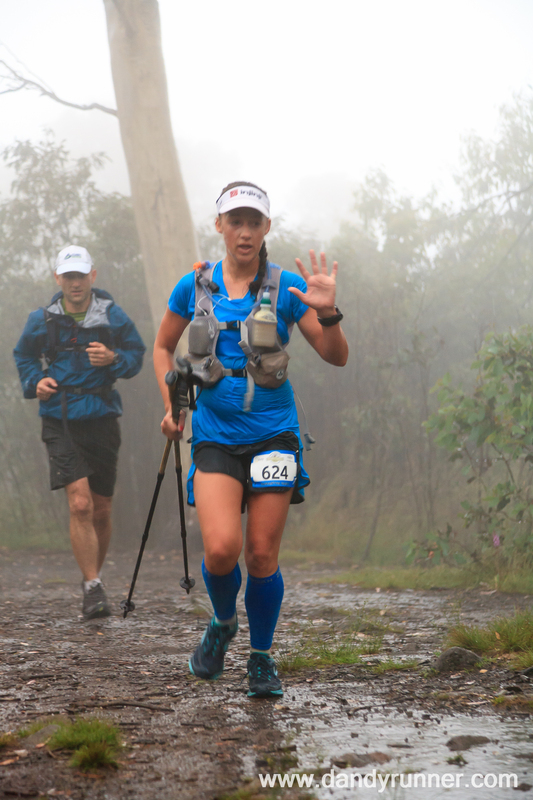 As a trail lover, racing in conditions that stripped away all the b.s. until running was done for the sheer thrill of the run itself was utter exhilaration. Brilliant morning, one worth doing all over again even if the forecast and conditions were exactly the same. In my opinion, a 64km race where nobody ran past the 35km mark does not give us a result (unless everyone DNFed – and that wasn’t the case). I’m not sure how that statement can be construed as disrespect to the organisers, volunteers or competitors, particularly when I mentioned the high quality of everyone’s input. I also don’t see how that disrespects the frontrunners – those were some very impressive splits for such horrendous conditions and are not to be dismissed as slow or suspect just because the race was stopped at that point. I was happy with where I was at Langford’s, in terms of my position, time and how I was feeling. But I don’t finish races by speculation, projection or the Duckworth-Lewis system. If I didn’t get to Hotham, I didn’t get a race result. It was an amazing and worthwhile experience, but that’s not a result. It’s not anybody’s fault, it’s just how it is, and I’m sure I’m not alone in feeling that way. A lot has been said and well covered here, for me both as an RD of 5 races and assistant to Andy for 2 it is a privilege to watch and learn from the cool head that Andy has when dealing with adverse situations. A true credit to his commitment to trail running and the safety of all ahead of all else. The weather bureau rarely get it right, so who are we to second guess them. 3 Cheers for Andy I say, hip hip hooray! hip hip hooray! hip hip hooray! Looking forward to 2013 version, I so hope we see all the same runners at the start line. Thanks Brett, there was no mistaking you as you ran around hammering in hurricane pegs ! Those gazebo’s were so worth the investment. You and Andy make a great team. Would love to hear from you and Andy on what worked well, what you would drop and what you would modify in your risk mitigation plan? This would be a great lesson for any budding RD’s to utilise. Experience counts for a lot and you guys have heaps both as runners and RD’s Let us hope Maroondah Dam is nice and easy from a RD perspective and still brutally hard from a runners perspective. Would be a very useful document for a number of RD around the place putting on events in isolated locations. Particularly with reflection on what was successful and what might need to be done differently in future. Nothing speaks more than experience and Im sure if one of the other Running Wild committee members has not already asked, such information would be invaluable to an organisation like ours. Well done on what sounds like an incredibly well executed plan. firstly i understand Andy’ call on the race cancellation,although these conditions are what trail running is about,either extreme heat or cold,trail runners are supposed to be a “tougher breed”,the conditions of the day sort runners out and the runners that adapt do well.Sean Williams article made some good points between track and trail runners, although throwing loads of money at track runners to move over to trail running then “watch the times drop” doesnt always work;We dont run flat track in sunny conditions with no wind wearing as little weight as possible to acheive a speedy time;We run long distances,over any terrain in any conditions-thats why we dont look like “bean poles”. Excellent decision to cancel at that point and excellent execution, from the look of it. My commiserations to those who trained hard, traveled far and didn’t get to finish. Shall I congratulate Whippet for a record number of non-finishers this year 😉 Perhaps just for having all accounted for. It seems the radio comms were an essential part of the plan and I think they’re important for all races where there is not constant mobile phone coverage. I’ve been manning a checkpoint in one race and had no communication for the entire duration. I didn’t know who was on the course and had no idea if anyone was lost. I didn’t get any news until the RD drove out to visit me. A lot of runners try to get away with really minimal gear. If you’ve been through one major storm in the alps (or even just hiked through the aftermath of it) then you’ll appreciate the benefits of carrying the extra gear, even if it slows you down. The mandatory gear list for the Alpine Challenge is more like the bad-weather gear for B2H and it’s required for all distances including the 2x 30km event. The RD asks entrants to describe their navigation skills and wilderness experience. A PLB and an emergency bivvy are provided. It’s a totally different race from B2H, later in the year and with longer unsupported sections, but it’s made me reconsider what I carry for every race and training run. As for ‘who would be a race director?’ I can only say that we’re lucky that people like Whippet would be a race director… people who understand our running because they’re runners themselves and therefore won’t cancel a race unless they need to; people who also have a really good understanding of the area and what can happen in bad conditions, have a plan and the ability to execute it. Although not there myself, I agree that Andy’s experience and protocols that he has pulled together for this would benefit a lot of RDs in Australia. There’s always only a very small chance that things go wrong, but it’s when they do go wrong that it hits the headlines. Because of Andy’s quick thinking, serious issues were mitigated. They’re often very hard calls to make, because in the cold light of day, people can always say that it was OK to carry on. However it’s not until something goes seriously wrong that people then question it with hindsight. Great call Andy and well done all for the valuable contributions here too – hopefully this thread / article will be used again and again in the future as an example of how to get it right. Andy, hats off to you, Brett, Wendy and all the volunteers. Good call to finish at Langford. There will always be another race to run and it’s best that everyone survives in one piece to be able to do so. Who would be a race director indeed!